San Luis Obispo County Supervisor Adam Hill quietly left the dais and disappeared from a board meeting Tuesday as his colleagues presented an award to the Community Action Partnership of San Luis Obispo (CAPSLO) for the agency’s 50th anniversary. Hill never said why he left the meeting for about 30 minutes. Hill was previously a leading proponent of CAPSLO. At that time, Hill failed to recuse himself on votes to provide millions in funding to CAPSLO, his significant other’s employer. 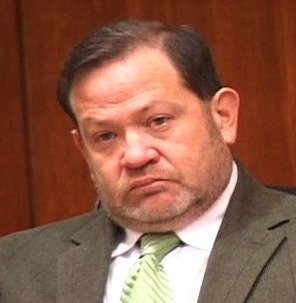 In 2014, Hill turned on the organization after it demoted his wife, Dee Torres-Hill, from her position as CAPSLO’s director of homeless services. In 2013, former and current CAPSLO employees said Torres-Hill had routinely taken gift cards intended for the needy and the homeless and made personal use of them. CAPSLO administrators denied most of the allegations against Torres-Hill and cleared her of wrongdoing. But in March 2014, CAPSLO executives demoted Torres-Hill from her position as homeless services director and cut her pay. Hill responded by publicly chastising and threatening CAPSLO executives, and Torres-Hill later sued, claiming she was a whistleblower and the victim of retaliation. CAPSLO and Torres-Hill quietly settled the lawsuit in October. They did not disclose the details of the settlement. Just after Supervisor Debbie Arnold finished reading the resolution, Hill left the dais and walked out of the board chambers. He did not shake the hand of CAPSLO CEO Biz Steinberg who was approaching the dais at the time. Numerous other CAPSLO employees were also in attendance. They took photos with the four supervisors who remained. Hill returned to the dais at the beginning of the next item. What a big fat baby. How did such a childish and vindictive yahoo ever get elected to the BOS? Has Biz been an incompetent CEO? Depends who you ask I suppose. Those that have seen her in action, have known her to resort to tears, emotional pleas, behind the back manipulation, threats, power plays… so much so that at some point, she has been disingenuous. She either knows full well what the culture of her agency is, or she truly is incompetent. I’ve always believed Biz Steinberg to be an incompetent CEO. Then she and Mr. Hill should have a lot to talk about since he is a incompetent supervisor. With a name like “Biz” ((, is there any doubt?